Generalised calculation of the intermittency of wind power and its impact on the cost of wind power. Various papers have been published on determining the effect that having a spread of turbines over a large area has on the variability of wind power output. An individual turbine may not produce any power for around 20% of the time but it is argued that this is mitigated when there are many turbines spread over a large area. It is possible to analyse this in a more general way than is usual and this is the aim of this web page. The approach taken is well-known in other fields but it does not seem to have been applied to the output of multiple turbines. There are two parts to the analysis. The first part aims to establish how a large number of turbines reduces the standard deviation (or root mean square) of the fluctuating power output compared to the mean power output. 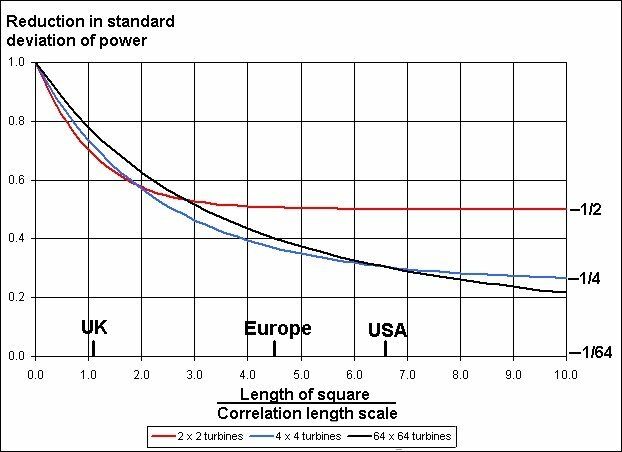 Then, using this result, estimates are obtained of the proportion of time that the power output of multiple turbines drops below some low threshold level or, for that matter, what proportion of time is spent above some threshold power level. Standard deviation of the fluctuating power. i.e the overall mean power is just the sum of the mean power of all the turbines. Now let us consider the mean square of the fluctuating component of the overall power. where the bars over the top of the variables represents the time-averaged values. For simplicity, it will be assumed in everything that follows that the N turbines are all the same and that they are producing the same mean power and the same standard deviation of fluctuating power. A very simple result will be considered first and that is the case when there is no correlation between any of the fluctuating components of the power i.e. all the cross-products are zero. Under these circumstances, the relationship between the ratio of the standard deviation to the mean power for the collection of turbines compared to a single turbine is given by:- Thus, the ratio is reduced by 1/√N. This is a well-known result for reducing the signal-to-noise ratio in such things as electronic amplifiers. By having a number of amplifiers in parallel, the signal noise ratio will be improved because the noise contribution from the amplifers themselves will be uncorrelated and tend to cancel one another out. where r is the distance between two turbines. For r in kilometres, a good fit is obtained with L=454 kilometres. L will be referred to as the correlation length scale. Using this result in equation (3) enables us to compute the standard deviation of fluctuating power for any distribution of turbines. Before doing this, one further result should be noted. If, in a given area, we introduce more and more turbines, they begin to approach a continuous distribution of power which can be represented as a continuous power source per unit area - see the figure below. Under these circumstances, the expression for the ratio of standard deviation to mean power becomes:- Even with the simple expression equation (1) for the correlation coefficient, it does not seem possible to obtain an analytic solution to the above equation apart from a straight line of continuous turbines. However, the limiting case can be computed numerically and provides a means at looking at how the standard deviation behaves for a widely dispersed but rather evenly spaced distribution of turbines. The figure below shows the computed ratio of the standard deviation of a square array of turbines compared to a single turbine as a function of the number of turbines in the array and the ratio of the width of the square to the correlation scale L.
The simplest array - shown by the red line - is a square with a turbine at each corner. When the side of the square exceeds about two correlation length scales, L, the power ouptut from the turbines becomes uncorrelated and the reduction in the standard deviation is then given by equation (1) - a reduction by a factor of two. The blue curve shows the results for a 4 x 4 grid of wind turbines and the reduction in standard deviation approaches equation (1) when the spacing between the turbines reaches about 8 correlation length scales.The black curve shows the results for a 64 x 64 array of turbines and this is effectively equivalent to a continuous distribution represented by equation (5). The aymptotic standard deviation of 1/64 will not be reached until the length of the square reaches about 128 times the correlation length. We can now put some practical interpretation to these results. The USA has a land area of about 9 million square kilometres, the European Community about 4 million square metres and the UK about 250,000 square kilometres. Using the correlation length scale of 454 kilometres, we can get a rough estimate of the reduction in the standard deviation treating each land mass as a rectangle of equivalent area. On the previous web page, it was shown the ratio of the standard deviation of the power variations to the mean value for a single turbine was close to unity and so the black curve above effectively shows this ratio for a turbine array as a function of the ratio of the square root of the land area to the correlation length scale. The table below tabulates the results for the USA, Europe and the UK. Reduction in standard deviation due to a distribution of turbines. We now have a measure of the reduction in the standard deviation of power variations and we now can make estimates of what proportion of time the output from a distribution of turbines falls below various power levels. 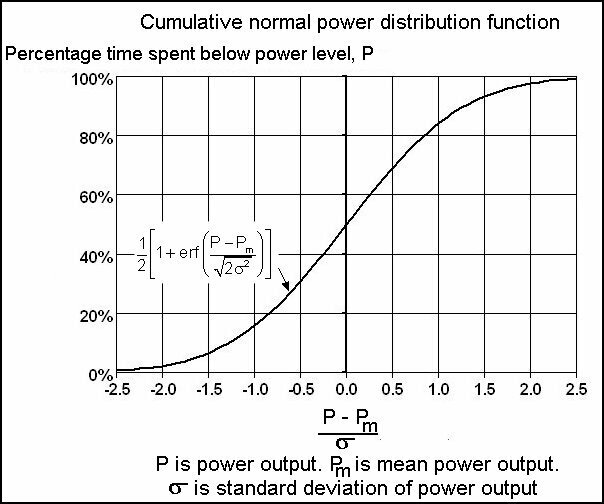 Power probability distribution and the proportion of time spent below different power thresholds. Although the power probability distribution from a singe turbine is far from a normal Gaussian distribution, the distribution from many turbines will approach close to a normal distribution - the central limit theorem. Assuming a normal distribution, the figure below shows the cumulative power distribution function for a continuous array of turbines - it is simply the erf function shown. From the cumulative distribution above, the percentage of time that the turbine array spends below various power level thresholds can be calculated. The figure below shows the calculation for power levels of 5%, 10% and 20% of the mean power level. Although probability calculations reveal estimates of the proportions of time spent below various power thresholds, they do not contain information about how the time intervals are made up. 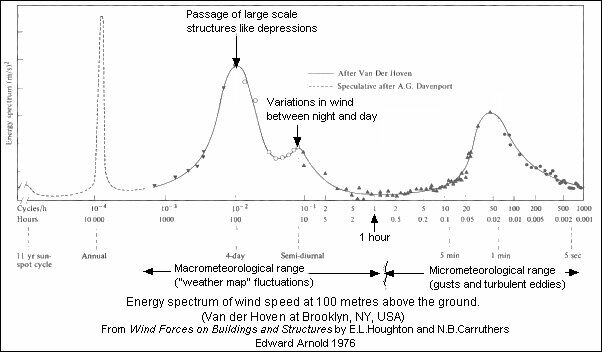 The figure below shows a classic result for the energy spectrum of the wind obtained in New York. Variations in wind speed that occur on a time scale of, say, an hour or less are produced on a local scale and will not correlate over distances of the order of the correlation length scale (i.e 454 kilometres) and so, for an extensive array of turbines, power fluctations on these smaller time scales will be largely smoothed out. It can be seen that there is a peak in the spectrum at about four days and this is caused by the passage of large scale weather systems - most usually low pressure depressions - and it is these structures that are responsible for the correlations at large distances. Those familiar with spectral analysis will know that the correlation curve and the energy spectrum are, in fact, related. Reverting to our probability analysis, the contribution to the percentage times below various threshold levels for a turbine array will arise mainly from the passage of weather systems and will take place in intervals over the order of a day or so. From the point of view of using wind power as a contributor to a national power system, this is fortunate in one sense because weather forecasting is sufficiently accurate that fluctuations in the power output for a wind turbine system can thus be predicted a few days ahead with a high degree of certainty. 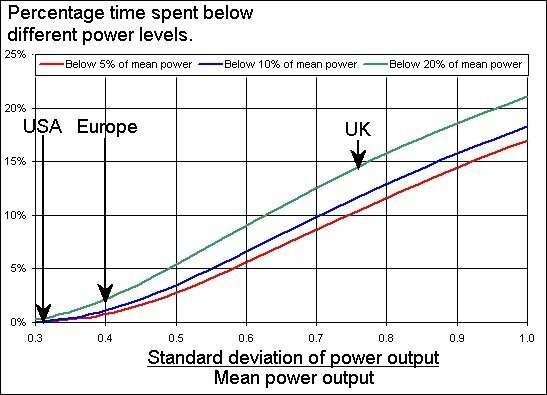 On the other hand, the graph on percentage times shows that for a country the size of the UK, there will be of the order of a month per year made up in periods of a day or so at a time when the power ouput from a wind power system will fall to below 5% of the mean power ouput. As a result, it will be necessary to have a sufficient margin of spare power capacity from other sources to compensate for the power from the turbine system falling virtually to nothing. Even when a European grid system is in operation, the percentage time graph shows that there will be a few days per year (i.e. about 1% or 2% of the time) when wind power is at a very low level. To illustrate the point, the figure below shows a weather map covering Europe on the 1st April 2009. An extensive high pressure region covers the whole of Northern Europe and even in the more southerly areas, the isobars are widely spaced. These low power periods will most generally occur as a result of a high pressure anti-cyclones - very hot weather in summer and cold sunny weather in winter. Even for very large land masses like the USA, the problem of intermittency of wind power is still a significant issue although on a somewhat smaller scale than for either the UK or Europe. In the USA, back-up power sources equivalent to perhaps 80% or 90% of the mean wind power output might be feasible but the statistics of wind power would need to be examined in finer detail than is possible here to establish precisely what might be acceptable. cost implications for 100% backup of wind power. In the discussion above, it was shown that whilst the power from a wind turbine system even on a European scale could fall to a negligible level, it would do so over a period of a day or so and, because of the accuracy of short range weather forecasting, it would do so in a fairly predictable manner. However, the change in power ouput could easily be of a very large magnitude since it is possible to go from very windy conditions to the establishment of an anti-cyclone with almost no wind in the period of one or two days. Energy sources that would need to be brought on line to compensate for the lack of wind power would therefore not need to have a very short response time but should be capable of being brought online over a period of about a day. Gas turbine power stations are an ideal candidate for this back-up source because even an efficent combined cycle gas turbine (CCGT) power station can be brought from a cold start up to full power in 5 to 10 hours. The composition of cash flows in operating gas turbine power stations is very different from that of wind farms. As will be shown shortly, gas fire power stations are relatively cheap to construct with fuel costs being the major outgoing. By contrast, wind farms are expensive to construct but have zero fuel costs. Because of these differences, it is not obvious how best to make simple cost comparisons for the energy they produce. Additionally, the capital costs of power sources of all sorts have been fluctuating significantly over the last few years due to large changes in materials and component costs and also due to exchange rate fluctuations. The price of gas has also risen steeply and is between two and three times the cost in the 1990's. Consequently, estimating power supply costs is an uncertain business and published figures show a good deal of variability. The assumptions in the costings - gleaned from various sources - are listed below. Construction costs of combined cycle gas power stations are taken as £1 million per megawatt and the station life time is taken to be 30 years life time. This amounts to 0.38p per kW-hr. However, it is also assumed the the construction costs are financed by a loan with an annual interest rate of 10% repayable over the 30 years. When the total cost is calculated, servicing the loan adds a further 0.83p per kW-hr. Annual maintenance costs of 4% of the construction costs are assumed. No allowance is made for interest payments on these maintenance charges and they add 0.46p per kW-hr to the power costs. Natural gas costs about 2p per kW-hr at the moment (2011). Gas power stations have an efficiency of about 50% so that fuel costs are thus around 4p per kW-hr. Construction costs of wind turbines have risen sharply over the last few years and now stand at around £1.5 million per rated megawatt for onshore wind turbines and £2.5 million for far offshore wind turbines. For a hub wind speed of 7.5 metres/second , the capacity factor is about 0.35 whereas at 8.5 metres/second, it is about 0.45. 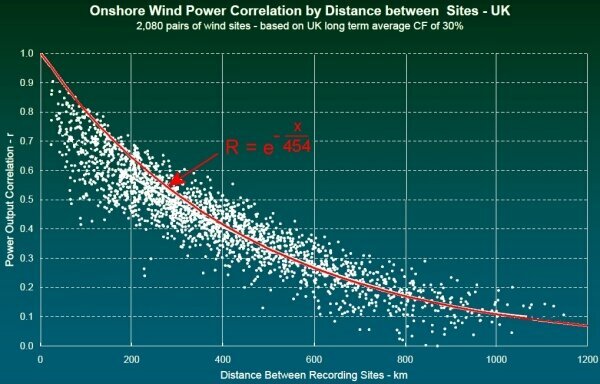 However, far offshore wind speeds are nearer 10 metres/second which gives capacity factors as high as 0.55. With a lifetime of 20 years, this gives construction costs of 3.26p, 2.54p and 3.11p per kW-hr for the three cases. Once again, it is assumed that the construction costs are financed through a loan with an annual interest of 10% repayable over 20 years. This adds 4.4p, 3.4p and 4.2p per kW-hr respectively for the three cases. Annual maintenance costs are assumed to be 2% of construction costs for onshore wind turbines and 4% for offshore turbines. This results in 1.3p, 1p and 2.5p per kW-hr for the three cases. There are no fuel costs. Backup costs are assumed to be just the capital costs of gas fired power stations plus interest and maintenance charges - i.e. 1.67p per kW-hr. No additional fuel charges are involved because wind power will be above and below its mean level for roughly equal periods. The figure below gives a graphical representation of these costs. It is important to stress that whilst these costings may not be very precise, they do reflect the widely differing make-up of gas and wind power costs. Even if the various assumptions about costs are 'tweaked' with plausible bands, the features of the cost structures are relatively unchanged. Gas is characterised by low capital cost and high fuel cost with short operating response times. By contrast, wind power has a high capital cost, no fuel costs and a random power output that fluctuates for a continental scale system over periods of the order of day or so. In most analyses, the cost of wind power is shown as a single value but here we have included estimates for different wind speeds. As has been mentioned elsewhere on this website, it is astonishing that the importance of wind speed is barely mentioned in planning guidelines and yet it is plainly obvious that it is an important parameter. Had the UK planning guidelines PPS22 set a lower wind speed limit of, say, 8 metres/second on sites which were eligible for planning permission, it would have removed many unsuitable applications from planning disputes and also ensured that the average capacity factor for wind power would have been around 0.35 to 0.4 rather than about 0.25 which is roughly the current value (ref.4). The cost implications of this lack of proper management of onshore wind is plain to see in the figures. In the present context, the other important point to note is that the need for a 100% back-up for wind power imposes a less onerous cost burden that one might intuitively imagine. Indeed, it is clear that the main development thrust to make wind power more competitive is to reduce the capital costs. There are many papers and reports dealing with future developments in renewable energy and opinions about how things will develop are wildly varied. However, there is a small concensus that the cost of constructing wind farms will fall by around 20% to 30% over the next decade. Wind turbine and wind turbine foundation design are still evolving technologies and there is quite a lot of scope for simplifying the designs and improving the reliability. The latter is particularly important for far-offshore wind farms which will be more difficult and expensive to service than onshore wind farms. There is also a general concensus that gas prices will continue to rise and, if this is the case, it could easily result in the cost of wind power falling significantly below that of gas. Even now, they are not too different in price. The intermittent nature of wind power is an intrinsic characteristic and so it will always be necessary for a more predictable power source to be available for meeting the base load - unless a mechanism for large scale power storage can be found. With existing technology, the only non-carbon dioxide producing power source capable of meeting base load requirements is nuclear fission power stations. For the UK, the sort of mix that can be envisaged without technological breakthroughs and within 15 to 20 years is, say, 15 gigawatts of nuclear, 15 gigawatts of wind power (about 5 gigawatts onshore and 10 gigawatts offshore) and 30 gigawatts of gas of which 15 gigawatts would be necessary to provide backup for periods of low wind speed. This sort of mix would reduce the consumption of fossil fuels and also give the UK greater security for its electricity supply. It is important to reiterate that the wind power figures quoted above are all deliverable mean powers not rated powers - which are the maximum powers that wind turbines are capable of. It is likely that the main development of wind power in the future will consists of wind turbines with rated powers of 5 megawatts or more which will deliver between 2 to 2.5 megawatts of mean power. In order to provide 15 gigawatts of mean power, this requires somewhere between 6000 to 7500 wind turbines. However, this does require that large wind farms must be sited only in those locations where high mean wind speeds of 8 metres/second or more are available. From an overall energy supply standpoint, there is little point or place for on-shore developments of one or two turbines in locations where wind speeds are not particularly high. The power contribution from these small wind farms is negligible and at a high unit of energy cost. Nonetheless, it is a no-brainer for land owners like farmers to seek to install wind turbines because they can obtain an income and a good return on investment from the very generous feed-in tariffs. For the same reason, one can expect to see an increasing number of turbines on industrial sites. As far as 'domestic' sized turbines are concerned, these can also offer a good return on the investment if the site is suitably windy (i.e. greater than 6 metres/second) and they have the additional benefit of providing some independence from grid supplied electricity. These small turbines have a negligible impact on the visual environment whereas the visual impact of larger turbines is a very contentious issue from which lawyers are the ones to derive most benefit. 1. The Cost of Generating Electricity. Royal Academy of Engineering Report. March 2004. 2. Developing a sustainable energy strategy. Royal Academy of Engineering Report. July 2006. 3. 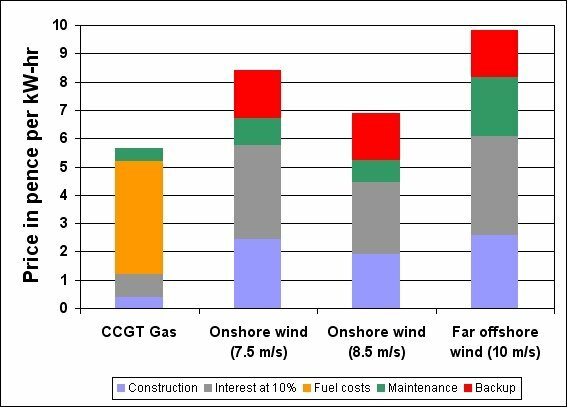 Great Expectations: the cost of offshore wind in UK waters - understanding the past and projecting the future. UK Energy Research Centre Report. July 2010. 4. Analysis of UK Wind Power Generation. Stuart Young Consulting Report. March 2011. 5. Electricity Generation Cost Model - 2011 Update. Department for Energy and Climate Change Report. June 2011.